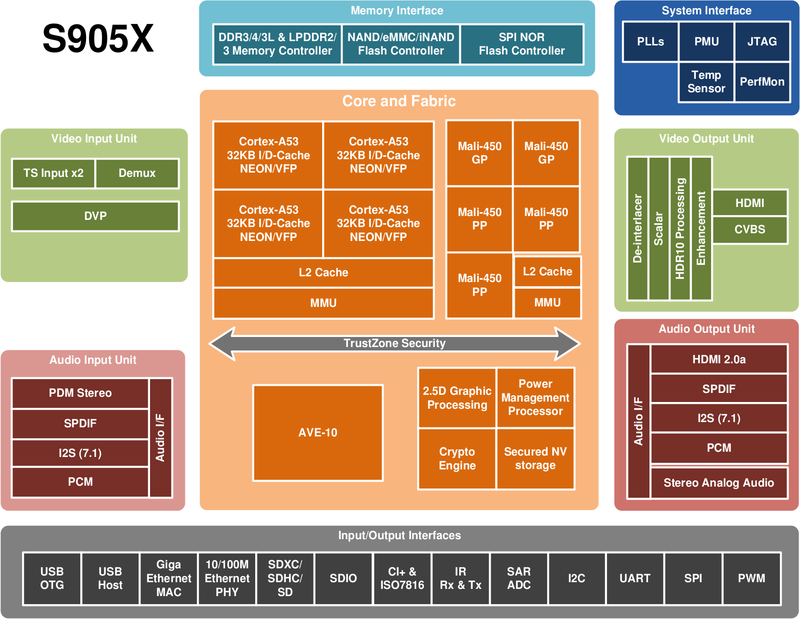 A few weeks ago, I wrote about the upcoming Amlogic S905M quad core Cortex A53 processor support 4K VP9 and 10-bit HEVC, but the silicon manufacturer seems to struggle with sticking with a name, as after the initial S908 part, they moved to S905M, before hopefully settling on Amlogic S905X, for which I received more information include a block diagram, and more detailed specifications. 3D Graphics Processing Unit – Penta-core ARM Mali-450 GPU up to 750MHz+ (DVFS) with two geometry/vertex processors, three pixel processors supporting OpenGL ES 1.1/2.0 and OpenVG 1.1. 2.5D Graphics Processor – Fast bitblt engine with dual inputs and single output, programmable raster operations (ROP) and polyphase scaling filter, etc..
Video Post-Processing Engine – HDR10 processing, REC709/BT2020 processing, motion adaptive 3D noise reduction filter, advanced motion adaptive edge enhancing de-interlacing engine, 3:2 pull-down support, deblocking fliters, etc.. Multiple sleep modes for CPU, system, DRAM, etc. While we’ve now got much more details, the main features of Amlogic S905X have not changed since last month, so they’ll probably stay that way. I don’t have specific information about availability of the processor yet.